Martyr, Bishop of Beneventum. St. Januarius is believed to have suffered in the persecution of Diocletian, c. 305. With regard to the history of his life and martyrdom, we know next to nothing. The various collections of "Acts", though numerous (cf. Bibliotheca Hagiographica Latina, n. 4115-4140), are all extremely late and untrustworthy. Bede (c. 733) in his "Martyrologium" has epitomized the so-called "Acta Bononiensia" (see Quentin, Les Martyrologes historiques", 76). To this source we may trace the following entry in the present Roman Martyrology, though the reference to the miracle of the liquefaction is an addition of much later date. "At Pozzuoli in Campania [the memory] of the holy martyrs Januarius, Bishop of Beneventum, Festus his deacon, and Desiderius lector, together with Socius deacon of the church of Misenas, Proculus deacon of Pozzuoli, Eutyches and Acutius, who after chains and imprisonment were beheaded under the Emperor Diocletian. The body of St. Januarius was brought to Naples, and there honourably interred in the church, where his holy blood is kept unto this day in a phial of glass, which being set near his head becomes liquid and bubbles up as though it were fresh." In the Breviary a longer account is given. There we are told that "Timotheus, President of Campania," was the official who condemned the martyrs, that Januarius was thrown into a fiery furnace, but that the flames would not touch him, and that the saint and his companions were afterwards exposed in the amphitheatre to wild beasts without any effect. Timotheus declaring that this was due to magic, and ordering the martyrs to be beheaded, the persecutor was smitten with blindness, but Januarius cured him, and five thousand persons were converted to Christ before the martyrs were decapitated. Then, as the Breviary lesson continues, "the cities of these coasts strove to obtain their bodies for honourable burial, so as to make sure of having them advocates with God. By God's will, the relics of Januarius were taken to Naples at last, after having been carried from Pozzuoli to Beneventum and from Beneventum to Monte Vergine. When they were brought thence to Naples they were laid in the chief church there and have been there famous on account of many miracles. Among these is remarkable the stopping of eruptions of Mount Vesuvius, whereby both that neighbourhood and places afar off have been like to be destroyed. 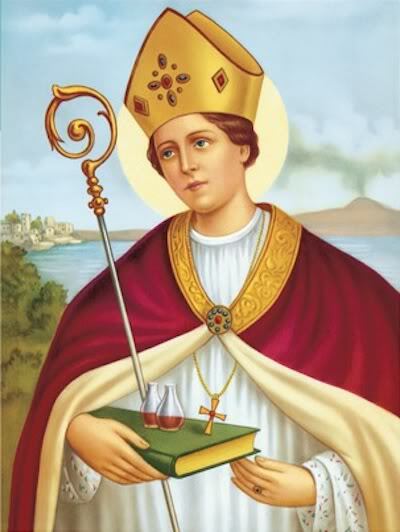 It is also well known and is the plain fact, seen even unto this day, that when the blood of St. Januarius, kept dried up in a small glass phial, is put in sight of the head of the same martyr, it is wont to melt and bubble in a very strange way, as though it had but freshly been shed." O God, who grant us to venerate the memory of the Martyr Saint Januarius, give us, we pray, the joy of his company in blessed happiness for all eternity. Through our Lord Jesus Christ, your Son, who lives and reigns with you in the unity of the Holy Spirit, one God, for ever and ever.